As someone who very much enjoys cookies, cakes and other confections (IÂ was a pastry chef, after all) this whole no wheat thing really had me concerned–especially when so many gluten-free baked goods are gritty or crumbly or just plain miss the mark. And since we started the testing portion just after Thanksgiving, I wanted to make sure I could make desserts and sweets that family and coworkers would enjoy that were also safe for me. It was, thankfully, a lot easier than I thought it would be, and it’s mainly due to a book I’ve mentioned before: the Favorite Brand Name Gluten-Free 3 Books in 1 put out by Publications International Ltd. As I mentioned before, I picked it up on the discount rack of Marshalls or TJ Maxx, so it might be tough to find in your regular store, but if you see it, it’s definitely worth picking up. That said, here’s the two most important things I got from that book: replacement flour blends, one for quick breads and cooking making, and one for yeast breads. Mix together and store in an air-tight container. Refrigerate if you bake infrequently. The original recipes list cornstarch but I use arrowroot because it’s easier for more people to digest and it dissolves and thickens faster, so I like to have it on hand anyway. YouÂ can use almond flour in place of coconut flour if you’re just looking for gluten-free, but almonds were recently found to be even higher in FODMAPs that originally thought, so really should be used sparingly. Same goes for bean flours–Bob’s Red Mill, for instance, has an all-purpose gluten-free baking mix but it’s primarily bean-based, which would make it high in FODMAPs, and not a good option for this particular lifestyle. The thing about these flour blends and why they work is that each ingredient performs a certain function that wheat flour does on it’s own. The grains alone (rice, sorghum, millet) won’t really give you the same results without the addition of some sort of starch (tapioca, arrowroot, cornstarch) and even those two components together aren’t doing much in the way of protein (which the nut flours contribute). The other benefit to these blends is that no one ingredient takes center stage in either texture or flavor. So even though coconut flour tends to be very coconutty on it’s own, when it’s in the blend it’s not very noticeable, and when the baked goods are finished you can hardly tell it’s there at all (unless you’ve got sensitive taste buds, like me). What about commercially available blends? So far the only gluten-free and Low-FODMAP flour blend I’ve been satisfied with is Gluten-Free Bisquik, and even then it tends to be a little more on the gritty side than I prefer. More times than not I use the blends above and have far better results than any of the mixes or pre-fab products I’ve tested. Not all of these go into my flour blends, but many do! There’s one other thing you need in order to successfully bake gluten-free and/or Low-FODMAP: Xanthum or Guar Gum. Gums get a certain amount of smack talked about them, but they are the best way to prevent the crumbly, mealy texture so common in wheat-free baked goods. Xanthum gum is usually made from corn while guar gum comes from a bean. Both are used in such small amounts that neither are likely to impact digestion to any large degree, but use whichever you feel most comfortable with. I use xanthum gum because I had it on hand from a previous ice cream experiment (it’s commonly found on low-fat or fat-free dairy products to improve texture, though too much will make the end product more slippery than anything else). I didn’t write down where I found that but it’s come in handy as I’ve converted old recipes to my new lifestyle. Xanthum gum is also the only ingredient I keep in the freezer to preserve it as it’s one of the more expensive ingredients and gets used up so slowly. Did I succeed that first Christmas in making delectable goodies for friends and family? Yes. So much so that most didn’t realized they were eating anything out of the ordinary. I’ve continued to bake with these flour blends, and use them in stove-top preparations like roux and gravies, for the last half a year and my friends routinely comment that if the commercial products came out like mine, no one would mind going gluten-free (or whatever) when necessary. Unfortunately, coconut flour is NOT low FODMAP. However, gluten is. Have you tried adding vital wheat gluten to a flour blend? Flax seed, chia seed, potato flour (not starch), pectin, gelatin, agar, and konjac are also gluten replacers. Flax and chia have FODMAPs but in most flour blends, the amount is low enough that the final foods would still be low FODMAP. I know this is an old post, but please don’t conflate gluten free and low fodmap. Most people who claim gluten sensitivity are actually FODMAP intolerant, but are totally fine with gluten! For those people on a low FODMAP diet, vital wheat gluten can be a powerful tool in binding low FODMAP flours. By steering them away from gluten you are doing them a disservice. Yes, you are correct. Which is why I pointed out that gluten is not a FODMAP within the body of the article. And why I’ve said elsewhere (online and in person) that just because something is gluten free does not mean it’s Low-FODMAP. The two are not the same. Fact is, the vast majority of people navigating the Low-FODMAP process are not the types to make everything from scratch. 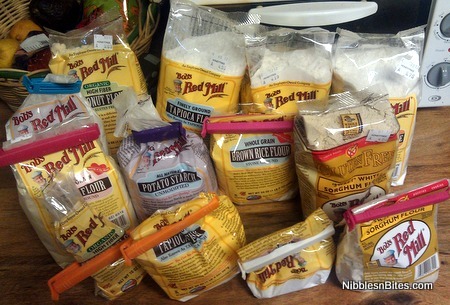 The flour blends I’ve listed above are probably even a bit daunting for some (based on anecdotal evidence, of course). They are much more likely to seek out convenience products and the growing availability of gluten free products is where they’re going to start. Plus, once you’ve gone through the stricter Elimination and Challenge phases of the protocol, it becomes a balancing act as we try to maintain as broad a diet as possible without provoking symptoms. Gluten free goods are often a relatively safe way to eliminate a large source of fructans in any given meal, thus lowering the cumulative effects of the FODMAPs in our systems. Also, when I make foods for gatherings, etc., there’s a good chance there’s going to be someone else in the receiving group that is gluten free or intolerant. By learning to work around the gluten factor entirely, I make my food safer for more people to enjoy. To each their own.